Transmission electron micrograph of a mesenchymal stem cell displaying typical ultrastructural characteristics. Mesenchyme is embryonic connective tissue that is derived from the mesoderm and that differentiates into hematopoietic and connective tissue, whereas MSCs do not differentiate into hematopoietic cells. Stromal cells are connective tissue cells that form the supportive structure in which the functional cells of the tissue reside. While this is an accurate description for one function of MSCs, the term fails to convey the relatively recently discovered roles of MSCs in the repair of tissue. The term encompasses multipotent cells derived from other non-marrow tissues, such as placenta, umbilical cord blood, adipose tissue, adult muscle, corneal stroma or the dental pulp of deciduous baby teeth. The cells do not have the capacity to reconstitute an entire organ. Mesenchymal stem cells are characterized morphologically by a small cell body with a few cell processes that are long and thin. The cell body contains a large, round nucleus with a prominent nucleolus, which is surrounded by finely dispersed chromatin particles, giving the nucleus a clear appearance. The remainder of the cell body contains a small amount of Golgi apparatus, rough endoplasmic reticulum, mitochondria and polyribosomes. The cells, which are long and thin, are widely dispersed and the adjacent extracellular matrix is populated by a few reticular fibrils but is devoid of the other types of collagen fibrils. Bone marrow was the original source of MSCs, and still is the most frequently utilized. These bone marrow stem cells do not contribute to the formation of blood cells and so do not express the hematopoietic stem cell marker CD34. They are sometimes referred to as bone marrow stromal stem cells. The youngest and most primitive MSCs may be obtained from umbilical cord tissue, namely Wharton's jelly and the umbilical cord blood. However MSCs are found in much higher concentration in the Wharton’s jelly compared to cord blood, which is a rich source of hematopoietic stem cells. The umbilical cord is available after a birth. It is normally discarded and poses no risk for collection. These MSCs may prove to be a useful source of MSCs for clinical applications due to their primitive properties. Adipose tissue is a rich source of MSCs (or adipose-derived mesenchymal stem cells, AdMSCs). The developing tooth bud of the mandibular third molar is a rich source of MSCs. While they are described as multipotent, it is possible that they are pluripotent. They eventually form enamel, dentin, blood vessels, dental pulp and nervous tissues. These stem cells are capable of producing hepatocytes. Stem cells are present in amniotic fluid. As many as 1 in 100 cells collected during amniocentesis are pluripotent mesenchymal stem cells. MSCs have a great capacity for self-renewal while maintaining their multipotency. Beyond that, there is little that can be definitively said. The standard test to confirm multipotency is differentiation of the cells into osteoblasts, adipocytes and chondrocytes as well as myocytes and neurons. MSCs have been seen to even differentiate into neuron-like cells, but there is lingering doubt whether the MSC-derived neurons are functional. The degree to which the culture will differentiate varies among individuals and how differentiation is induced, e.g., chemical vs. mechanical; and it is not clear whether this variation is due to a different amount of "true" progenitor cells in the culture or variable differentiation capacities of individuals' progenitors. The capacity of cells to proliferate and differentiate is known to decrease with the age of the donor, as well as the time in culture. Likewise, whether this is due to a decrease in the number of MSCs or a change to the existing MSCs is not known. MSCs have an effect on innate and specific immune cells. MSCs produce many molecules having immunomodulatory effects. These include prostaglandin E2 (PGE2), nitric oxide, indolamin 2,3-dioxigenase (IDO), IL-6, and other surface markers - FasL, PD-L1 / 2. MSCs have an effect on macrophages, neutrophils, NK cells, mast cells and dendritic cells in innate immunity. MSCs are able to migrate to the site of injury, where they polarize through PGE2 macrophages in M2 phenotype which is characterized by an anti-inflammatory effect. Further, PGE2 inhibits the ability of mast cells to degranulate and produce TNF-α. Proliferation and cytotoxic activity of NK cells is inhibited by PGE2 and IDO. MSCs also reduce the expression of NK cell receptors - NKG2D, NKp44 and NKp30. MSCs inhibit respiratory flare and apoptosis of neutrophils by production of cytokines IL-6 and IL-8. Differentiation and expression of dendritic cell surface markers is inhibited by IL-6 and PGE2 of MSCs. The immunosuppressive effects of MSC also depend on IL-10, but it is not certain whether they produce it alone, or only stimulate other cells to produce it. MSC expresses the adhesion molecules VCAM-1 and ICAM-1, which allow T-lymphocytes to adhere to their surface. Then MSC can affect them by molecules which have a short half-life and their effect is in the immediate vicinity of the cell. These include nitric oxide, PGE2, HGF, and activation of receptor PD-1. MSCs reduce T cell proliferation between G0 and G1 cell cycle phases and decrease the expression of IFNγ of Th1 cells while increasing the expression of IL-4 of Th2 cells. MSCs also inhibit the proliferation of B-lymphocytes between G0 and G1 cell cycle phases. MSCs can produce antimicrobial peptides (AMPs). These include human cathelicidin LL-37, β-defensines, lipocalin 2 and hepcidin. MSCs effectively decrease number of colonies of both gram negative and gram positive bacteria by production of these AMPs. In addition, the same antimicrobial effect of the enzyme IDO produced by MSCs was found. Mesenchymal stem cells in the body can be activated and mobilized if needed. However, the efficiency is low. For instance, damage to muscles heals very slowly but further study into mechanisms of MSC action may provide avenues for increasing their capacity for tissue repair. Clinical studies investigating the efficacy of mesenchymal stem cells in treating diseases are in preliminary development, particularly for understanding autoimmune diseases, graft versus host disease, Crohn's disease, multiple sclerosis, systemic lupus erythematosus and systemic sclerosis. As of 2014, no high-quality clinical research provides evidence of efficacy, and numerous inconsistencies and problems exist in the research methods. Many of the early clinical successes using intravenous transplantation came in systemic diseases such as graft versus host disease and sepsis. Direct injection or placement of cells into a site in need of repair may be the preferred method of treatment, as vascular delivery suffers from a "pulmonary first pass effect" where intravenous injected cells are sequestered in the lungs. The International Society for Cellular Therapy (ISCT) has proposed a set of standards to define MSCs. A cell can be classified as an MSC if it shows plastic adherent properties under normal culture conditions and has a fibroblast-like morphology. In fact, some argue that MSCs and fibroblasts are functionally identical. Furthermore, MSCs can undergo osteogenic, adipogenic and chondrogenic differentiation ex vivo. The cultured MSCs also express on their surface CD73, CD90 and CD105, while lacking the expression of CD11b, CD14, CD19, CD34, CD45, CD79a and HLA-DR surface markers. The majority of modern culture techniques still take a colony-forming unit-fibroblasts (CFU-F) approach, where raw unpurified bone marrow or ficoll-purified bone marrow Mononuclear cell are plated directly into cell culture plates or flasks. Mesenchymal stem cells, but not red blood cells or haematopoetic progenitors, are adherent to tissue culture plastic within 24 to 48 hours. However, at least one publication has identified a population of non-adherent MSCs that are not obtained by the direct-plating technique. Other flow cytometry-based methods allow the sorting of bone marrow cells for specific surface markers, such as STRO-1. STRO-1+ cells are generally more homogenous and have higher rates of adherence and higher rates of proliferation, but the exact differences between STRO-1+ cells and MSCs are not clear. Methods of immunodepletion using such techniques as MACS have also been used in the negative selection of MSCs. The supplementation of basal media with fetal bovine serum or human platelet lysate is common in MSC culture. Prior to the use of platelet lysates for MSC culture, the pathogen inactivation process is recommended to prevent pathogen transmission. In 1924, Russian-born morphologist Alexander A. Maximov (Russian: Александр Александрович Максимов); used extensive histological findings to identify a singular type of precursor cell within mesenchyme that develops into different types of blood cells. Scientists Ernest A. McCulloch and James E. Till first revealed the clonal nature of marrow cells in the 1960s. An ex vivo assay for examining the clonogenic potential of multipotent marrow cells was later reported in the 1970s by Friedenstein and colleagues. In this assay system, stromal cells were referred to as colony-forming unit-fibroblasts (CFU-f). The first clinical trials of MSCs were completed in 1995 when a group of 15 patients were injected with cultured MSCs to test the safety of the treatment. Since then, more than 200 clinical trials have been started. However, most are still in the safety stage of testing. Subsequent experimentation revealed the plasticity of marrow cells and how their fate is determined by environmental cues. 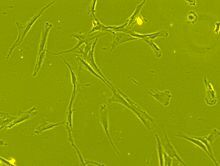 Culturing marrow stromal cells in the presence of osteogenic stimuli such as ascorbic acid, inorganic phosphate and dexamethasone could promote their differentiation into osteoblasts. In contrast, the addition of transforming growth factor-beta (TGF-b) could induce chondrogenic markers. ^ Ankrum JA, Ong JF, Karp JM (March 2014). "Mesenchymal stem cells: immune evasive, not immune privileged". Nature Biotechnology. 32 (3): 252–60. doi:10.1038/nbt.2816. PMC 4320647. PMID 24561556. ^ Mahla RS (2016). "Stem Cells Applications in Regenerative Medicine and Disease Therapeutics". International Journal of Cell Biology. 2016: 6940283. doi:10.1155/2016/6940283. PMC 4969512. PMID 27516776. ^ Porcellini A (2009). "Regenerative medicine: a review". Revista Brasileira de Hematologia e Hemoterapia. 31 (Suppl. 2). doi:10.1590/S1516-84842009000800017. ^ Valero MC, Huntsman HD, Liu J, Zou K, Boppart MD (2012). "Eccentric exercise facilitates mesenchymal stem cell appearance in skeletal muscle". PLoS ONE. 7 (1): e29760. Bibcode:2012PLoSO...729760V. doi:10.1371/journal.pone.0029760. PMC 3256189. PMID 22253772. ^ a b Wang S, et al. (2012). "Clinical applications of mesenchymal stem cells". Journal of Hematology & Oncology. 5: 19. doi:10.1186/1756-8722-5-19. PMC 3416655. PMID 22546280. ^ Branch MJ, Hashmani K, Dhillon P, Jones DR, Dua HS, Hopkinson A (2012). "Mesenchymal stem cells in the human corneal limbal stroma". Invest. Ophthalmol. Vis. Sci. 53 (9): 5109–16. doi:10.1167/iovs.11-8673. PMID 22736610. ^ Netter, Frank H. (1987). Musculoskeletal system: anatomy, physiology, and metabolic disorders. Summit, New Jersey: Ciba-Geigy Corporation. p. 134. ISBN 978-0-914168-88-1. ^ Brighton CT, Hunt RM (1991). "Early histological and ultrastructural changes in medullary fracture callus". The Journal of Bone and Joint Surgery. 73 (6): 832–47. doi:10.2106/00004623-199173060-00006. PMID 2071617. ^ Gregory, Carl A.; Prockop, Darwin J.; Spees, Jeffrey L. (10 June 2005). "Non-hematopoietic bone marrow stem cells: Molecular control of expansion and differentiation". Experimental Cell Research. Molecular Control of Stem Cell Differentiation. 306 (2): 330–35. doi:10.1016/j.yexcr.2005.03.018. PMID 15925588. ^ Bunnell, Bruce A.; Flaat, Mette; Gagliardi, Christine; Patel, Bindiya; Ripoll, Cynthia (1 June 2008). "Adipose-derived stem cells: Isolation, expansion and differentiation". Methods. Methods in stem cell research. 45 (2): 115–20. doi:10.1016/j.ymeth.2008.03.006. PMC 3668445. PMID 18593609. ^ "What is Cord Tissue?". CordAdvantage.com. 30 October 2018. ^ Jiang Y, Jahagirdar BN, Reinhardt RL, Schwartz RE, Keene CD, Ortiz-Gonzalez XR, Reyes M, Lenvik T, Lund T, Blackstad M, Du J, Aldrich S, Lisberg A, Low WC, Largaespada DA, Verfaillie CM (2002). "Pluripotency of mesenchymal stem cells derived from adult marrow". Nature. 418 (6893): 41–49. doi:10.1038/nature00870. PMID 12077603. ^ Franco Lambert AP, Fraga Zandonai A, Bonatto D, Cantarelli Machado D, Pêgas Henriques JA (2009). "Differentiation of human adipose-derived adult stem cells into neuronal tissue: Does it work?". Differentiation. 77 (3): 221–28. doi:10.1016/j.diff.2008.10.016. PMID 19272520. ^ Engler AJ, Sen S, Sweeney HL, Discher DE (2006). "Matrix Elasticity Directs Stem Cell Lineage Specification". Cell. 126 (4): 677–89. doi:10.1016/j.cell.2006.06.044. PMID 16923388. ^ Spaggiari, Grazia Maria; Abdelrazik, Heba; Becchetti, Flavio; Moretta, Lorenzo (25 June 2009). "MSCs inhibit monocyte-derived DC maturation and function by selectively interfering with the generation of immature DCs: central role of MSC-derived prostaglandin E2". Blood. 113 (26): 6576–6583. doi:10.1182/blood-2009-02-203943. ISSN 1528-0020. PMID 19398717. ^ a b Ren, Guangwen; Zhao, Xin; Zhang, Liying; Zhang, Jimin; L'Huillier, Andrew; Ling, Weifang; Roberts, Arthur I.; Le, Anh D.; Shi, Songtao (1 March 2010). "Inflammatory cytokine-induced intercellular adhesion molecule-1 and vascular cell adhesion molecule-1 in mesenchymal stem cells are critical for immunosuppression". Journal of Immunology. 184 (5): 2321–2328. doi:10.4049/jimmunol.0902023. ISSN 1550-6606. PMC 2881946. PMID 20130212. ^ Akiyama, Kentaro; Chen, Chider; Wang, DanDan; Xu, Xingtian; Qu, Cunye; Yamaza, Takayoshi; Cai, Tao; Chen, WanJun; Sun, Lingyun (4 May 2012). "Mesenchymal-stem-cell-induced immunoregulation involves FAS-ligand-/FAS-mediated T cell apoptosis". Cell Stem Cell. 10 (5): 544–555. doi:10.1016/j.stem.2012.03.007. ISSN 1875-9777. PMC 3348385. PMID 22542159. ^ Kim, Jaehyup; Hematti, Peiman (December 2009). "Mesenchymal stem cell-educated macrophages: a novel type of alternatively activated macrophages". Experimental Hematology. 37 (12): 1445–1453. doi:10.1016/j.exphem.2009.09.004. ISSN 1873-2399. PMC 2783735. PMID 19772890. ^ Brown, J. M.; Nemeth, K.; Kushnir-Sukhov, N. M.; Metcalfe, D. D.; Mezey, E. (April 2011). "Bone marrow stromal cells inhibit mast cell function via a COX2-dependent mechanism". Clinical and Experimental Allergy. 41 (4): 526–534. doi:10.1111/j.1365-2222.2010.03685.x. ISSN 1365-2222. PMC 3078050. PMID 21255158. ^ Kay, Linda J.; Yeo, Wilfred W.; Peachell, Peter T. (April 2006). "Prostaglandin E2 activates EP2 receptors to inhibit human lung mast cell degranulation". British Journal of Pharmacology. 147 (7): 707–713. doi:10.1038/sj.bjp.0706664. ISSN 0007-1188. PMC 1751511. PMID 16432506. ^ Spaggiari, Grazia Maria; Capobianco, Andrea; Becchetti, Stelvio; Mingari, Maria Cristina; Moretta, Lorenzo (15 February 2006). "Mesenchymal stem cell-natural killer cell interactions: evidence that activated NK cells are capable of killing MSCs, whereas MSCs can inhibit IL-2-induced NK-cell proliferation". Blood. 107 (4): 1484–1490. doi:10.1182/blood-2005-07-2775. ISSN 0006-4971. PMID 16239427. ^ Raffaghello, Lizzia; Bianchi, Giordano; Bertolotto, Maria; Montecucco, Fabrizio; Busca, Alessandro; Dallegri, Franco; Ottonello, Luciano; Pistoia, Vito (January 2008). "Human mesenchymal stem cells inhibit neutrophil apoptosis: a model for neutrophil preservation in the bone marrow niche". Stem Cells. 26 (1): 151–162. doi:10.1634/stemcells.2007-0416. ISSN 1549-4918. PMID 17932421. ^ Jiang, Xiao-Xia; Zhang, Yi; Liu, Bing; Zhang, Shuang-Xi; Wu, Ying; Yu, Xiao-Dan; Mao, Ning (15 May 2005). "Human mesenchymal stem cells inhibit differentiation and function of monocyte-derived dendritic cells". Blood. 105 (10): 4120–4126. doi:10.1182/blood-2004-02-0586. ISSN 0006-4971. PMID 15692068. ^ Ma, S.; Xie, N.; Li, W.; Yuan, B.; Shi, Y.; Wang, Y. (February 2014). "Immunobiology of mesenchymal stem cells". Cell Death and Differentiation. 21 (2): 216–225. doi:10.1038/cdd.2013.158. ISSN 1476-5403. PMC 3890955. PMID 24185619. ^ Ren, Guangwen; Zhang, Liying; Zhao, Xin; Xu, Guangwu; Zhang, Yingyu; Roberts, Arthur I.; Zhao, Robert Chunhua; Shi, Yufang (7 February 2008). "Mesenchymal stem cell-mediated immunosuppression occurs via concerted action of chemokines and nitric oxide". Cell Stem Cell. 2 (2): 141–150. doi:10.1016/j.stem.2007.11.014. ISSN 1875-9777. PMID 18371435. ^ Di Nicola, Massimo; Carlo-Stella, Carmelo; Magni, Michele; Milanesi, Marco; Longoni, Paolo D.; Matteucci, Paola; Grisanti, Salvatore; Gianni, Alessandro M. (15 May 2002). "Human bone marrow stromal cells suppress T-lymphocyte proliferation induced by cellular or nonspecific mitogenic stimuli". Blood. 99 (10): 3838–3843. ISSN 0006-4971. PMID 11986244. ^ a b Augello, Andrea; Tasso, Roberta; Negrini, Simone Maria; Amateis, Andrea; Indiveri, Francesco; Cancedda, Ranieri; Pennesi, Giuseppina (May 2005). "Bone marrow mesenchymal progenitor cells inhibit lymphocyte proliferation by activation of the programmed death 1 pathway". European Journal of Immunology. 35 (5): 1482–1490. doi:10.1002/eji.200425405. ISSN 0014-2980. PMID 15827960. ^ Glennie, Sarah; Soeiro, Inês; Dyson, Peter J.; Lam, Eric W.-F.; Dazzi, Francesco (1 April 2005). "Bone marrow mesenchymal stem cells induce division arrest anergy of activated T cells". Blood. 105 (7): 2821–2827. doi:10.1182/blood-2004-09-3696. ISSN 0006-4971. PMID 15591115. ^ Corcione, Anna; Benvenuto, Federica; Ferretti, Elisa; Giunti, Debora; Cappiello, Valentina; Cazzanti, Francesco; Risso, Marco; Gualandi, Francesca; Mancardi, Giovanni Luigi (1 January 2006). "Human mesenchymal stem cells modulate B-cell functions". Blood. 107 (1): 367–372. doi:10.1182/blood-2005-07-2657. ISSN 0006-4971. PMID 16141348. ^ Krasnodembskaya, Anna; Song, Yuanlin; Fang, Xiaohui; Gupta, Naveen; Serikov, Vladimir; Lee, Jae-Woo; Matthay, Michael A. (December 2010). "Antibacterial effect of human mesenchymal stem cells is mediated in part from secretion of the antimicrobial peptide LL-37". Stem Cells. 28 (12): 2229–2238. doi:10.1002/stem.544. ISSN 1549-4918. PMC 3293245. PMID 20945332. ^ Sung, Dong Kyung; Chang, Yun Sil; Sung, Se In; Yoo, Hye Soo; Ahn, So Yoon; Park, Won Soon (March 2016). "Antibacterial effect of mesenchymal stem cells against Escherichia coli is mediated by secretion of beta- defensin- 2 via toll- like receptor 4 signalling". Cellular Microbiology. 18 (3): 424–436. doi:10.1111/cmi.12522. ISSN 1462-5822. PMC 5057339. PMID 26350435. ^ Gupta, Naveen; Krasnodembskaya, Anna; Kapetanaki, Maria; Mouded, Majd; Tan, Xinping; Serikov, Vladimir; Matthay, Michael A. (June 2012). "Mesenchymal stem cells enhance survival and bacterial clearance in murine Escherichia coli pneumonia". Thorax. 67 (6): 533–539. doi:10.1136/thoraxjnl-2011-201176. ISSN 1468-3296. PMC 3358432. PMID 22250097. ^ Alcayaga-Miranda, Francisca; Cuenca, Jimena; Martin, Aldo; Contreras, Luis; Figueroa, Fernando E.; Khoury, Maroun (16 October 2015). "Combination therapy of menstrual derived mesenchymal stem cells and antibiotics ameliorates survival in sepsis". Stem Cell Research & Therapy. 6: 199. doi:10.1186/s13287-015-0192-0. ISSN 1757-6512. PMC 4609164. PMID 26474552. ^ Meisel, R.; Brockers, S.; Heseler, K.; Degistirici, O.; Bülle, H.; Woite, C.; Stuhlsatz, S.; Schwippert, W.; Jäger, M. (April 2011). "Human but not murine multipotent mesenchymal stromal cells exhibit broad-spectrum antimicrobial effector function mediated by indoleamine 2,3-dioxygenase". Leukemia. 25 (4): 648–654. doi:10.1038/leu.2010.310. ISSN 1476-5551. PMID 21242993. ^ Heirani-Tabasi A, Hassanzadeh M, Hemmati-Sadeghi S, Shahriyari M, Raeesolmohaddeseen M (2015). "Mesenchymal Stem Cells; Defining the Future of Regenerative Medicine". Journal of Genes and Cells. 1 (2): 34–39. doi:10.15562/gnc.15. ^ Anderson, Johnathon D.; Johansson, Henrik J.; Graham, Calvin S.; Vesterlund, Mattias; Pham, Missy T.; Bramlett, Charles S.; Montgomery, Elizabeth N.; Mellema, Matt S.; Bardini, Renee L. (1 March 2016). "Comprehensive Proteomic Analysis of Mesenchymal Stem Cell Exosomes Reveals Modulation of Angiogenesis via Nuclear Factor-KappaB Signaling". Stem Cells. 34 (3): 601–13. doi:10.1002/stem.2298. ISSN 1549-4918. PMC 5785927. PMID 26782178. ^ Figueroa FE, Carrión F, Villanueva S, Khoury M (2012). "Mesenchymal stem cell treatment for autoimmune diseases: a critical review". Biol. Res. 45 (3): 269–77. doi:10.4067/S0716-97602012000300008. PMID 23283436. ^ a b Sharma RR, Pollock K, Hubel A, McKenna D (2014). "Mesenchymal stem or stromal cells: a review of clinical applications and manufacturing practices". Transfusion. 54 (5): 1418–37. doi:10.1111/trf.12421. PMC 6364749. PMID 24898458. ^ Fischer UM, Harting MT, Jimenez F, Monzon-Posadas WO, Xue H, Savitz SI, Laine GA, Cox CS (2009). "Pulmonary Passage is a Major Obstacle for Intravenous Stem Cell Delivery: The Pulmonary First-Pass Effect". Stem Cells and Development. 18 (5): 683–92. doi:10.1089/scd.2008.0253. PMC 3190292. PMID 19099374. ^ Hematti P (2012). 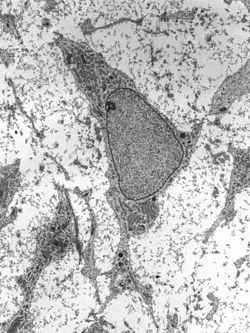 "Mesenchymal stromal cells and fibroblasts: a case of mistaken identity?". Cytotherapy. 14 (5): 516–21. doi:10.3109/14653249.2012.677822. PMID 22458957. ^ Dominici M; Le Blanc K; Mueller I; Slaper-Cortenbach I; Marini F; Krause D; Deans R; Keating A; Prockop Dj; Horwitz E (1 January 2006). "Minimal criteria for defining multipotent mesenchymal stromal cells. The International Society for Cellular Therapy position statement". Cytotherapy. 8 (4): 315–17. doi:10.1080/14653240600855905. PMID 16923606. ^ Wan C, He Q, McCaigue M, Marsh D, Li G (2006). "Nonadherent cell population of human marrow culture is a complementary source of mesenchymal stem cells (MSCs)". Journal of Orthopaedic Research. 24 (1): 21–28. doi:10.1002/jor.20023. PMID 16419965. ^ Gronthos S, Graves SE, Ohta S, Simmons PJ (1994). "The STRO-1+ fraction of adult human bone marrow contains the osteogenic precursors". Blood. 84 (12): 4164–73. PMID 7994030. ^ Oyajobi BO, Lomri A, Hott M, Marie PJ (1999). "Isolation and Characterization of Human Clonogenic Osteoblast Progenitors Immunoselected from Fetal Bone Marrow Stroma Using STRO-1 Monoclonal Antibody". Journal of Bone and Mineral Research. 14 (3): 351–61. doi:10.1359/jbmr.1999.14.3.351. PMID 10027900. ^ Tondreau T, Lagneaux L, Dejeneffe M, Delforge A, Massy M, Mortier C, Bron D (1 January 2004). "Isolation of BM mesenchymal stem cells by plastic adhesion or negative selection: phenotype, proliferation kinetics and differentiation potential". Cytotherapy. 6 (4): 372–79. doi:10.1080/14653240410004943. PMID 16146890. ^ Iudicone P, Fioravanti D, Bonanno G, Miceli M, Lavorino C, Totta P, Frati L, Nuti M, Pierelli L (January 2014). "Pathogen-free, plasma-poor platelet lysate and expansion of human mesenchymal stem cells". J Transl Med. 12: 28. doi:10.1186/1479-5876-12-28. PMC 3918216. PMID 24467837. ^ Stewart Sell (16 August 2013). Stem Cells Handbook. Springer Science & Business Media. p. 143. ISBN 978-1-4614-7696-2. ^ Becker AJ, McCulloch EA, Till JE (1963). "Cytological Demonstration of the Clonal Nature of Spleen Colonies Derived from Transplanted Mouse Marrow Cells". Nature. 197 (4866): 452–54. Bibcode:1963Natur.197..452B. doi:10.1038/197452a0. hdl:1807/2779. PMID 13970094. ^ Siminovitch L, Mcculloch EA, Till JE (1963). "The distribution of colony-forming cells among spleen colonies". Journal of Cellular and Comparative Physiology. 62 (3): 327–36. doi:10.1002/jcp.1030620313. hdl:1807/2778. PMID 14086156. Murphy MB, Moncivais K, Caplan AI (2013). "Mesenchymal stem cells: environmentally responsive therapeutics for regenerative medicine". Experimental & Molecular Medicine. 45 (11): e54. doi:10.1038/emm.2013.94. PMC 3849579. PMID 24232253.